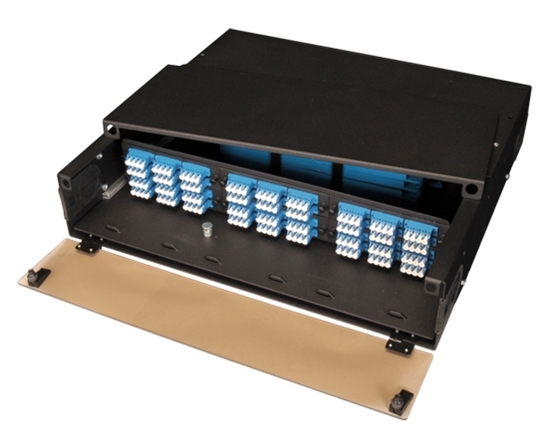 This rack mount fiber patch panel is a 2 Rack Unit (2RU) high density distribution unit that provides high density fiber capacity of up to 144 fibers when utilizing six of the LC Quad adapter panels shown and four of our 36 fiber splice trays (not included). The slide out master panel tray locks into the retracted and fully extended positions. The fiber housing has a split top design, allowing for easy termination access while bridge lances that run along the front of the unit provide easy tie down ability for fiber management entering or exiting the fiber enclosure.